Going across the Marian Route and visiting its sanctuaries allows the visitor, in addition a spiritual and intimate experience, to discover a territory with a rich artistic, cultural and natural heritage. The different attractions than can be found are cathedrals, castles, monasteries, churches, parks, landscapes & amazing scenery, gastronomy, wine cellars, or museums among others. All together makes this route a global destination with a high tourist and cultural value. Some people visit the sanctuaries as non believers. Tourist, visitors that are attracted by the artistic and architectural beauty of temples and their surrounding areas. 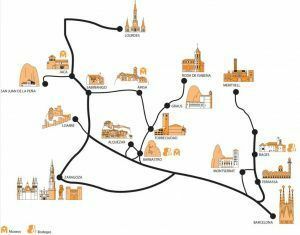 Therefore, the Marian Route has travelling options for everyone. For those who believe and for those who don not. Travelling options that are higtly recommended for everyone. The Marian Route, valid for the believers and for the art and nature lovers, possesses an importante number of ‘essential visits’ that are shown bellow. Do not miss the opportunity to visit them. 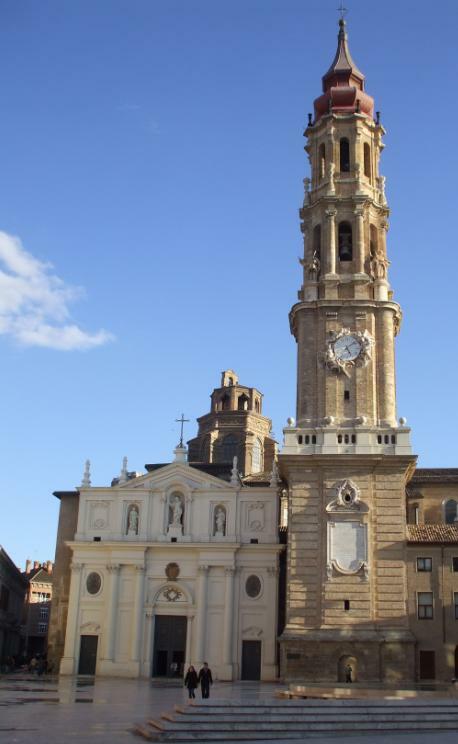 As a result of more than 2000 years of history, Zaragoza has a rich historic-artistic patrimony. Discover it! 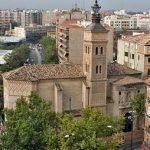 It was erected in the same spot where the roman temple, the Visigothic church and the main Muslim mosque were located. This wall closes the Saint Michael chapel; funerary chapel with an splendorous golden wood ceiling. 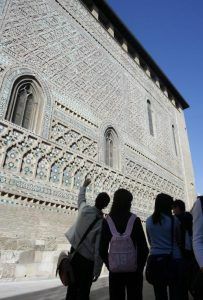 The dome is another valuable example of the importance of the Mudejar art in Aragón. The latest additions to the cathedral are the baroque tower and the classicist facade that were built in the 17th and 18th centuries. In the interior, the altarpiece stands out. It is a representative piece of the European gothic made in the 15th century. It is one of the UNESCO World Heritage sites. The “Parroquieta” wall is the highest expression of the Saragossa mudejar art. 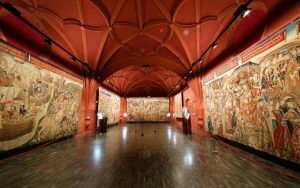 The Tapestries Museum is located inside the cathedral. The renovated Alma Mater Museum (the old ‘Diocesan Museum’) is located in the offices of the Archbishop’s Palace. The result is a perfect joining between the historic building and the works exhibited. 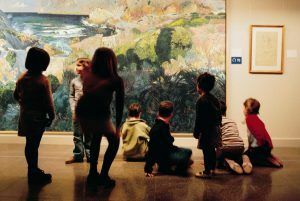 The visit is conceived to do with a guide, and so, along the route, the audiovisuals, the explanations and the museum publications will make the visit a great experience. The Aljaferia Palace is one of the UNESCO World Heritage sites. An astonishing Arabic palace located in the middle of the city. It was declared World Heritage Site due to the Aragonese Mudejar style that is part of its construction. This 11th century castle/palace was initially constructed as a recreation home, although later one was also used as a defense building. 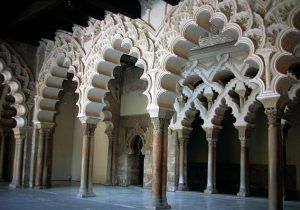 It is one of the most important monuments in Spanish-Muslim architecture. It was erected as a symbol of the power gained by the Zaragoza Taifa and it was called palace of happiness. Three are the main Islamic constructions that we can see today and that were built in the Taifas kingdoms. These buildings are the Alhambra in Granada, the Cordoba Mosque and the Aljafería Palace. The city of Caesar Augusta or Caesaraugusta. was founded around 15 b.c. This was the name that Zaragoza got on those days. It had the privilege of getting its name from the founder´s full name. The city was at its height during the 1st and 2nd centuries. This period brought many great public building works and some of those constructions can be seen today. The city walls, the river port, the forum, the public baths or the theatre. The City Walls: Zaragoza, an important centre in Roman Hispania, conserves part of the city wall. 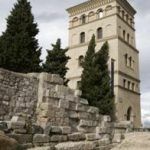 It’s located in the storic centre, next to the Pilar, and it’s an interesting archaeological remains that shows the importance of the city at the time. 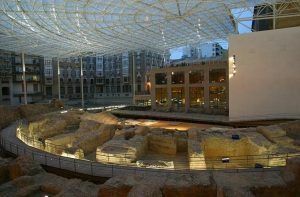 Public Bath Museum: In 1982-1983, during maintenance works on the streets, the remains of a large pool belonging to some Roman public baths were discovered. This find was extented in 1990 with the discovery of latrines belonging to an earlier stage. The public baths were situated in the centre of Caesaraugusta, in the area between the Forum and the Theatre. Forum Museum: The Forum was the heart in a Roman city. It was the main meeting point where the political, administrative, economic and religious life of the city developed. This monumental site was completed by numerous ornamental elements (sacrificial altars, honorific statues and triumphal arches), some of which are represented on coins from the city. Cesaraugusta Theatre: The theatre was the most popular building in the city. Situated in a privileged urban area, building was begun in Tiberius time.Architecturally, the Caesaravgvsta theatre is an excellent example of a prototype to be found all over the Roman Mediterranean world. It is a building constructed as an arena, unlike the theatres in which the spectators seats were on the side of a hill. 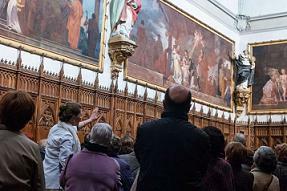 The figure of the genial Aragonese painter is linked to Zaragoza. Francisco de Goya y Lucientes was born in Fuendetodos, a small village near Zaragoza. The house where he was born can still be seen in that village and it has been declared National Historic Monument. Several of his paintings can be seen in Zaragoza. Some of these outstanding pieces can be found in the Basilica of the Pillar domes, as well as several engravings and portraits of distinguish noble and political figures of that age distributed among different museums in the city. The Pilar Basilica – The Goya paintings that can be seen in the domes are a very valuable representation dedicated to the religious devotion. ‘La adoración del nombre de Dios’ (The worship of God´s name) is a fresco of Italian influence and soft modeling. ‘Regina Martyrum’ is however a innovating and imaginative painting, very expressive and one of the most important pieces of Goya. This fresco confirmed him as a great painter. Oddly, he got hard reviews right after finishing it. 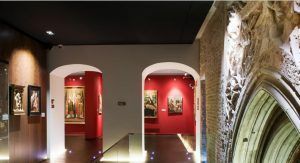 Zaragoza Museum – The Zaragoza Museum is one of the most recommended cultural visits in the city. The work of Goya here is extensive. We can emphasize your series of portraits painted in different moments of his career (Carlos IV, Maria Luisa of Parma, Fernando VII, the Duke of San Carlos…), pictures with religious themes and a variety of engravings. Location: Plaza de los Sitios, 6 – Zaragoza. Monday closed. Free entrance. Goya Museum – It is the only museum in the world that exposes all series of engravings of Francisco de Goya. Three floors: the first basedon history of Goya; the second floor is dedicated to Goya (religious paintings, portraits and engravings of ‘Los Caprichos’, ‘Los Desastres de la guerra’, ‘La Tauromaquia’ or ‘Los Disparates’); the third is dedicated to followers and imitators of Goya. 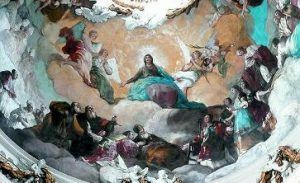 Aula Dei Monastery– Located just 15 km from Zaragoza, the Cartuja of the Aula Dei (Aula Dei Monastery) keeps one of the best and most unknown works by Francisco de Goya. It is a surprising visit, a set of 11 paintings that decorate the church of this monastery, dedicated to the Virgin Mary life. This unique architecture, specific from the Aragon autonomous community, is a UNESCO World Heritage site. The term “mudejar” comes from the Arabic word mudayyan that means “person who has been allowed to stay”. The origin of the Mudéjar art can be placed in the 12th century. It is the result of the particular political, social and cultural conditions that the mudejars had in the Spanish Reconquista. 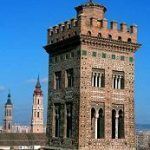 The Mudejar architecture is characterized by the use of bricks, plaster, ceramics or wood, as well as for the decoration based on crossing arches, geometrical compositions and vegetable like decoration. 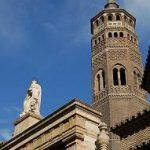 There are many and beautiful examples of Mudejar architecture in Zaragoza. 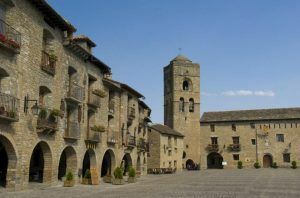 Torreciudad is an ideal starting point to see part of the tourist attractions located in the Aragón territory. Barbastro is the capital city of the Somontano region, one of the three region that surround the Sanctuary of Torreciudad. 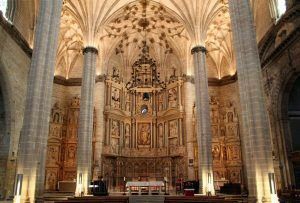 One of its main monuments is the magnificent Cathedral of la Asunción, 16th century, built on the site of the old mosque. The building was built with the purpose of re-establish for the city the category of an Episcopal See. With a Gothic appearance and an Renaissance inside design, the cathedral stands out for its large size and for its spectacular vaults. The design of the bank of the altarpiece is a work of the teacher Damiant Forment, who also performed the altarpiece from the Basilica del Pilar. The Cathedral of Barbastro is at the same level of the best churches. Next to the Cathedral is the Episcopal Palace which harbours the Diocesan Museum. Barbastro is the capital of the wine (Somontano region). The Wine Route is part of the tourist routes collected by the General Secretariat of Tourism of Spain. The visitor will be able to know different wineries and tourist establishments that will help him understand the local wine culture and local cuisine. The visit to Barbastro is completed with a walk for the old town, the Museum of the Claretian Martyrs and The Route of St. Josemaría. The founder of the Opus Dei and promoter of the construction of the Shrine of Torreciudad was born in Barbastro and is here where you can meet a series of relevant places in the life of St. Josemaría. More informatión: Tourism of Somontano (click here). More information in Tourism of Aragón. Graus and Ribagorza. Romanesque art and landscapes. Ribagorza is the region where is located the Sanctuary of Torreciudad. The Ribagorza shire is a land full of landscaping contrasts and beautiful Romanesque churches. Near Torreciudad is Graus. The historic area of this village was declared Historic and Artistic Site. It has one of the most beautiful butterwalked squares of the Spain, the Plaza Mayor. The style of the buildings, very close to the Italian Renaissance, made it become the location set for commercials that tried to recreated that country. But the most important building is the basilica of the Virgen de la Peña, the monument most visited. From this basilica you can give a magnificent view of the Graus. Another jewel of this area is Roda de Isábena, a lovely medieval village. 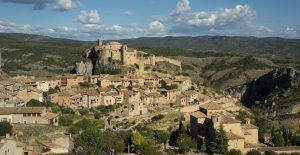 A visit to this village will take you to the spectacular Romanesque cathedral of San Vicente (11th to 13th centuries). The little cloister of the cathedral is a wonder place. One of the best examples of Lombard Romanesque art of the High Aragon is the Obarra Monastery (9th century). The church of the old monastery is one of the most important and primitive Romanesque construction of all the Spanish patrimony. As a natural space, the Posets Maladeta Natural Park offers a wide variety of activities for all kind of people. More information Tourism of Aragón. Aínsa and Sobrarbe. The Pineta Valley. Just after leaving Torreciudad, you will find the small village of Abizanda. It will surprise you due to its skyline shaped by the silhouette of the fortress. It is remarkable the strong Romanesque tower built by Lombard masters. The view from the top will allow you to contemplate the beauty of the shire and the Pyrenees. Continuing with the trip, you will arrive to Aínsa, capital of the Sobrarbe region, one of the most beautiful medieval villages in Spain. It has been declared Historic and Artistic Site. The walls that surround the village, as well as its historic side are extremely well preserved. The castle, the cathedral and the square stand out in the monumental area. For a better experience exploring the village, you should walk the streets and squares, eat at a restaurant and let yourself go with the enchantment found in every corner. Close to the border, we arrived to Bielsa, place of departure of countless tours through the valley of Pineta. This town is famous for its Carnival, one of the oldest and most tradition in the Pyrenees. The Pineta Valley is the north east side of the Ordesa and Monte Perdido National Park and one of the most wild but attractive valleys. If you have time, we recommend a visit to the open area where the image of “Virgin of Pineta”, near to the Parador (hotel). This tour goes through a beautiful road with a superb scenery. 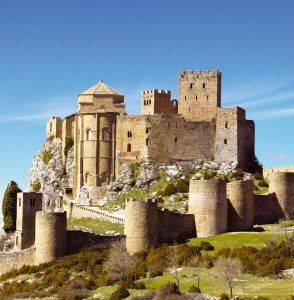 Located near Huesca, the Loarre Castle is the masterpiece of the Romanesque fortifications in the 11th century. It is preserved in amazing condition. This medieval castle is considered one of the best military and civil architecture constructions that can be seen nowadays in Europe. The castle can be visited with guided tour. His image is so remarkable that several directors have chosen this fortification as setting for theirs films, the most famous ‘Kingdom of heaven’, by Ridley Scott. Huesca is a very hospitable town. It is worth taking a look at the historic quarter. The Cathedral and the San Pedro el Viejo church are almost mandatory stops. 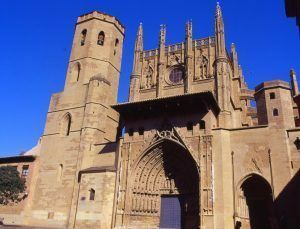 The Church of San Pedro el Viejo, declared as National Monument in 1885, is a simple and beautiful example of Romanesque architecture of Aragon and one of the jewels of the monumental heritage of the city. 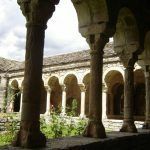 Its cloister, one of the most beautiful, is Royal Pantheon, the place where are the remains of the kings Alfonso I ‘the Warrior’ and Ramiro II ‘the Monk’. The Cathedral is a magnificent gothic temple. On the external you can appreciate a splendid decoration. The High Altar is the wonderful piece of Damian Forment, representing the Passion of Christ. 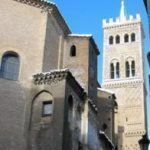 Next to the Cathedral is the Diocesan Museum, which offers genuine wonders of sacred art in its various rooms of jewelry, art, medieval, renaissance and baroque. Jaca is an important tourist center and winter sports with a great historical and monumental patrimony. It has a jewel of Spanish Romanesque, the Cathedral of San Pedro. Dated in the 11th century, this building constitutes one of the most important artistic treasures of Aragon and the peninsula. It was the first great Romanesque construction in Spain. The cathedral of Jaca is admired by its rich and varied sculptural decoration on capitals, walls and bases. In this aspect, it is necessary to emphasize the known ‘ajedrezado jaques’, a type of ornamentation that simulates a chess board. The cathedral welcome from 1963 a Diocesan museum with a permanent exhibition of artistic funds of the diocese. Almost on the border with France we arrived to Canfranc, before important village in the national territory for its strategic location border. Here, we can see one of the most beautiful railway stations, inaugurated by the Alfonso XIII king in 1925. Today is closed to traffic. 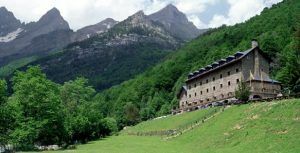 The Pyrenees villages of Boltaña, Fiscal, Broto and Torla take us to the entrance of a true natural beauty of the Aragonese Pyrenees: the Ordesa and Monte Perdido National Park. The highest mountain is Monte Perdido (11,007 feet) and the main valley is the Ordesa Valley as it is the main entrance to the park too. Several excursions of different difficulties will make possible the enjoyment of the greatness of this Natural beauty, the green valleys, forests, meadows, waterfalls and ravines. In 1997 got the highest award from the UNESCO as it was declared World Heritage together with the glaciers of the French side. The Sanctuary of Montserrat, set deep in a idyllic natural environment, is a place full of history, legend an culture. 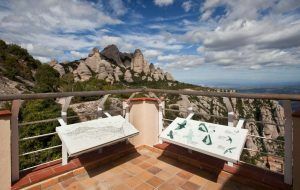 The Montserrat Mountain Natural Park is a unique mountain formation in the world, due to the particular and spectacular forms . The mountain was officially declared Natural Park in 1987 to guarantee its preservation. 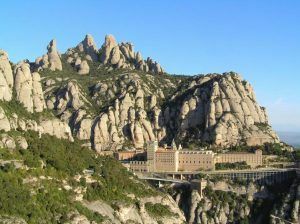 The word “Montserrat” comes from the Catalonian words “Mont” (mount) and “serrat” (serrated). Therefore, the meaning of the word is “the serrated mount”. The name is given due to the peculiar morphology of the mountain, as it looks like if the mountain was serrated. Throughout the time, the wind and the rain have been shaping the rocks, giving them very diverse forms. The Montserrat Museum is without question, one of the great exposition spaces in both Catalonia and Spain. It keeps more than 1,300 pieces of art from an extensive chronologic period. Some of those pieces are from artists as important as Picasso, Dalí or El Greco. The majority of the pieces in exhibition come from private donations. These donations were made with the purpose of making the art available for all visitors to the sanctuary. The monastery carries out those wishes continuing with the spirit of cultural service. Orient Biblical Archaeology: objects representing the cultures of Mesopotamia, Egypt, Cyprus and Palestine. Modern paintings and sculptures from the 19th to the 20th centuries. It includes pieces of artists such as Dalí, Monet, Sisley, Degas, Pissarro, Chagall, Le Corbusier, Miró, Picasso or Tápies among others. 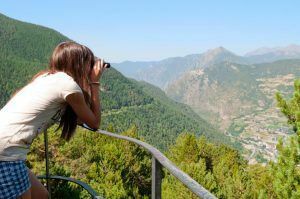 Opening hours: from monday to sunday: from 10.00 to 17.45 h.
On one side, the Saint Joan funicular that at 3000 feet offers a bird´s eye view of the sanctuary. On the Saint Joan top station, the tourist can visit the Nature Classroom where we will find information about the history of the mountain, the climatic characteristics… many excursions start from this top point. 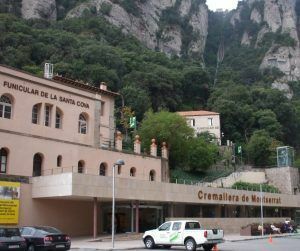 On the other side, the Santa Cova funicular links the sanctuary with the cave in the rock where, according to the legend, some shepherds found the image of the Virgin of Montserrat. The funicular arrives to the place where the Monumental Rosary begins. This rosary is the most important open air sculpture set of the Catalonian modernism. Pieces of Antonio gaudi, Josep Llimona and other authors are part of it. This path, in a shady area facing north-east, is flanked by holm-oaks, typical of Mediterranean climate. Its undergrowth consists ofbushes such as laurestine, holly or butcher’s broom. It is a peaceful path that invites torecollection, decorated with monuments dedicated to artists and maiolicas that evoke numerous Marian devotions.Follow the main street towards the car park. When you get to the building Mirador dels Apòstols, take the path that starts on the left side, whichruns in parallel with the road. After 25 min. you will get to the rock shelter Degotalls where, in former days, filtered water dripped from the rocks.You must then return the same way. 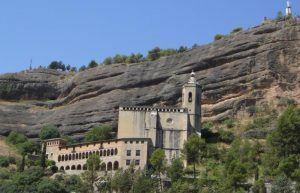 Tradition sets the finding of Our Lady of Montserrat in the place known as Santa Cueva (Holy Grotto). The chapel dates from the 18th century. It’s remarkable the monumental ensemble with the mysteries of the Rosary standing along the path. Head towards the cable car station (Aeri de Montserrat), walking down the stairs on the left side of the rack railway station (Cremallera). 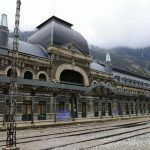 Take thepaved path that descends between the station and the rack railway tracks and, in 20 min., you will get to the lower station of Santa Cueva funicular. Follow then the way of the Rosary, wide and flanked by monuments which recall events in the lives of Jesus and Mary. It will take you another 20 min. to get to Santa Cueva’s chapel. Return using the same path. 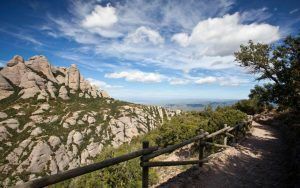 A hike of exceptional interest up to Montserrat’s summit, with spectacular views over the massif, and great part of Catalonia.Take Sant Joan funicular one-way and, right after getting out of the upper station, turn right and follow the signposted path. After a few metres,when the path turns left, you will be able to gaze at the pinnacles known as the Pregnant Woman, the Elephant, the Mummy and the LittleMummy. After 12 min from the start you will get to the foot of the Phrygian Cap, a peculiar pinnacle crowned with a cross. If you look down fromthe handrail you can see the Monastery. After a passage between two rocks, there is a vantage point on your left. The path, slightly uphill, entersthe forest, and crosses the Santa Maria stream (35 min.) through a wooden walkway. After this, you must continue uphill towards a paved path.On your right, you should be able to identify the path you are going to use on your way back to the Monastery. After this you will get to SantJeroni’s hermitage (60 min. ), where the path splits. Turn left, uphill, and within 10 minutes you will get to the summit, Sant Jeroni (1236 m.). Anorientation table allows you to identify the surrounding mountainous relief, from the Pyrenees to the Ports and Majorca. You will then return thesame way until the signposted crossroad by the paved path (1 h. 30 min. ), taking the path on our left that zigzags down to Pla dels Ocells (2 h.). Hereyou must take the path towards the Monastery. You will go past Panxa del Bisbe (The Bishop’s Belly) and then start a long descent downstairs,through Pas dels Francesos (Passage of the French) until the Monastery. A hike on the southern slope, on uneven terrain, often stony. It connects with hike 2 to Santa Cueva. 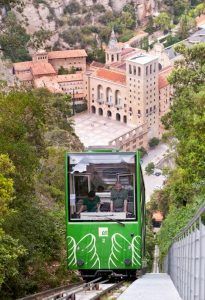 Take Sant Joan funicular one-way and, once on the upper station, take the wide, paved path on the left that climbs up to a hill. Once there, the path climbs slightly down towards Pla de Sant Miquel (20 min. ), where you reach a crossroad. You must take the path to Santa Cova and, shortly after, the path turns sharply. From here you will enjoy a beautiful view of river Llobregat and the ranges Sant Salvador, Puigventós, Sant Llorenç and the Montseny (35 min.). Within 45 min. you will get to a crossroad. Leave the red and white long-distance trail signs on your right, and follow the path on the left that will take you to Santa Cueva (Holy Grotto)(1h.). From here it becomes a paved path, with a strong, upward slope in the last part. Arrival at the monastery (1 h. 50 min.). A hike on Montserrat’s southern slope, through the ancient road from Collbató to Montserrat. Cannon batteries were placed at strategic points along the path during the Peninsular War (beginning of 19th century), which gave the name ‘Batteries’ to this path. Mediterranean, aromatic plants predominate. Take Sant Joan funicular one-way and, right after getting out of the upper station, take the signposted path towards Sant Joan hermitage. You will go past the pinnacle called Gorra Marinera (Sailor’s cap)(8 min.). After a few metres, you will find a little trail on the left towards Collbató throu- gh the stream of Font Seca (Dried up Fountain) (11 min. ), where you will start the descent. This path connects with the way of Bateries, which you will follow slightly uphill towards the left (35 min.). You will then reach Pla de Sant Miquel, where you must continue straight ahead towards Sant Miquel hermitage, clearly visible from here (1 h. 20 min.). Further on, you have the option of deviating from the main path to turn left to the Cross of Sant Miquel, with an impressive view of the Monastery. Back from the cross, you must retake the main path towards the Monastery through the holm-oak forest (1 h. 45 min.). • Montserrat’s topography is complicated. We are often faced with walls hardly visible from the top. Do not stray from the marked paths and,if you get lost, go back to the last known position, even if it means walking up. • Montserrat has few springs. You must carry water with you. • No fires must be lit in the Nature Park • The capture and collection of animals, rocks, minerals or plants is forbidden. • Always use bins or take away any kind of rubbish. 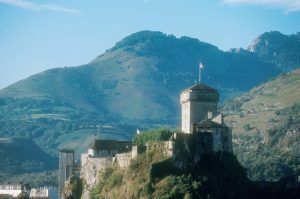 More information, from monday to friday, from 9 to 18.45 h. – Week-end and holidays, from 9 to 19.45 h.
Magnificent example of a Pyrenees fortress overlooking the city, which has never been conquered. It was declared Historic Monument and so it’s a listed historical monument and a museum of France. This site offers exceptional views of the city, the Sanctuaries and the Pyrenees. 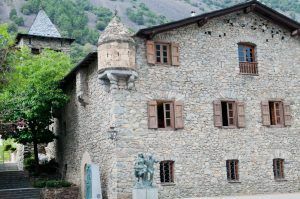 The Pyrenees Museum is located inside and has one of the most important collections about the history of these mountains. It overlooks the entire city and it is easily recognizable by the big cross that is lit when the night falls. Getting to the summit can be done using the funicular that offers the passengers incredible views. At the top, you have the best view: the Pyrenees, Lourdes, Pau and Tarbes can be seen. Located just 19 miles from Lourdes, the Pyrenees National Park is the great French Pyrenees Natural space. The union of six big valleys shapes this wide territory. This is the heart of the Park: astride the French-Spanish border, is the massif of Mont-Perdu that rises over 3,000m in altitude. To the south are the extraordinary canyons of Ordesa, Aniscle and Pineta. To their north, the land of cirques with the majestic Gavarnie. All this ensemble (two parks in true) are what is known as the Gavarnie-Monte Perdido Massif that was declared World Heritage by the UNESCO in 1997 and under de denomination “Pyrenees Monte Perdido cirques and canyons” for both natural and cultural reasons. Besides, the Pic du Midi de Bigorre and the Pont d’Espagne offer different spectacular views and a exceptonal wildlife. 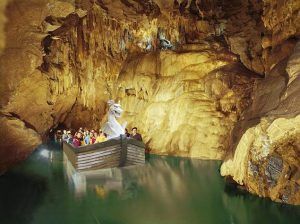 The coves offer a fantastic tour through stalactites, stalagmites, calcites and marmites. Most of this tour is done onboard a boat and through interior channels. Five levels stacked on top of each other like storeys of a house, with the levels having been hollowed out at different times. 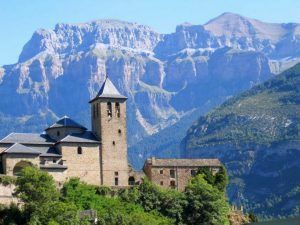 Meritxell emerges between mountains in the Country of the Pyrenees. But Andorra proposes numerous suggestions, you choose. The Casa de Vall can be found in the old district. It is a building of great dimensions that was built in 1580, one of the most symbolic monuments in the Principality together with Meritxell. It was constructed under the style of the big Catalonian masías and it was the main office of the General Council (Parliament of Andorra) until 2012 (another building was erected aside from Casa de Vall as new main office). History, beauty, political importance…The visitor have lots of reasons to visit this monument so important for the country. The guided visit of the interior of the building allows going around the different rooms and halls (the spectacular Criminal Court, the Hall of Lost Steps, paintings to the 16th century…), as well as the gardens. To visit it, you’ll need to buy a ticket. Andorra is in a border territory. It is a crossing point for roads and paths that communicate north and south Europe. Over the centuries and this geographic location made possible a series of mixtures and artistic and social fusions (local and foreign) that later on materialized in something more specific. The Andorran Pre-Romanesque and Romanesque art, one of the emblems of the country, is one of those high value manifestations. The different churches and architectonic constructions that can be visited throughout the principality are a privileged way to understand the history and culture the country. 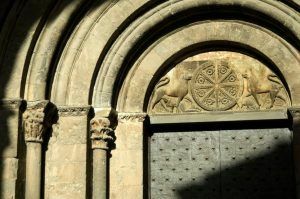 The Andorran Romanesque art takes us beyond the building itself; it somehow connect us with the old religious communities, with the community past time centers of the spiritual and social life. 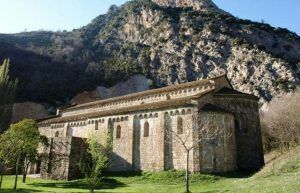 We can find more than forty Romanesque churches In the Andorran valleys. The an architectonic point of view, these churches are characterized for being simple constructions. They had small dimensions and bare decoration. However, they transmit beauty and spirituality without limits. St. Joan de Caselles, near the Sanctuary of Meritxell. It is a construction considered one of most important of the Romanesque Art in the principality. it keeps an image of Christ made in stucco that is unique in the world (12th century). Sanctuary of Canòlich, one of the most venerated hermitages. its remote location kept the farvour intact from the past times. St. Martí de la Cortinada, Romanesque church of the 12th century. There, the visitor can admire murals painted at the end of the 12th century, as well as other interesting pieces. St. Coloma church, is a beautiful example which main attraction is the circular bell tower of Lombardic Romanesque style. 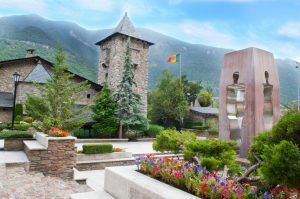 This bell tower, unique in Andorra, is at the same time one of the few still standing with this characteristics in the Pyrenees. Nature is another one of the great emblems of this country. Andorra is the ‘Country of the Pyrenees’, it is nature at its best, in pure state. Landscapes formed by mountains, rivers, lakes, forests, springs, meadows… are usually found all over the place. Knowing that these elements are present, it is easy to presume the spectacularity and splendor of these lands. 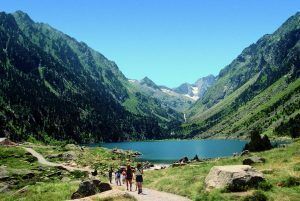 Andorra has more than 70 lakes and more than 80 peaks that overpass the 2,000 meters of height. Lakes are very important elements of the principality landscaping wealth. This allows the visitor the enjoyment of wonderful landscapes. Due to this, the beauty enhanced by these mountain Lakes becomes an attractive not easy to be found in other places. – the Valley of the Madriu-Perafita-Claror, was declared World Heritage by UNESCO in 2004 in the category of Cultural Landscape due to its beauty and its historical and cultural value. – the Natural Park of Sorteny, with great interest due to its beauty and recreational value. – the Natural Park of Comapedrosa. Here you can find the highest peak in the country (2,942 meters above the sea level). The main attraction of this space are: the impressive high mountain landscape, as well as the lakes, waterfalls and springs. Andorra is a snow paradise. Sports, beautiful sceneries, fun and entertainment are characteristic associated to snow. The snow-covered landscapes, the Romanesque churches with white roofs, the spectacular white mountains are postcards that are difficult to find anywhere else. 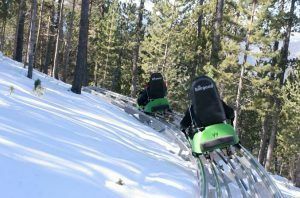 For those wishing to complete the visit of the Sanctuary of Meritxell with some adventure, the Grandvalira and Vallnord ski resorts offer 310 km of tracks to enjoy ski and other snow sports (the largest in Europe). During the summer, the ski resorts become an authentic nature amusement park. A wide range of activities are available in this great natural stage. Mountain bike excursions, quads, hiking routes or long walks allow the enjoyment of nature in all its versions. Older and young will be able to enjoy these leisure and entertainment options. Located in Sant Juliá is Naturlandia. 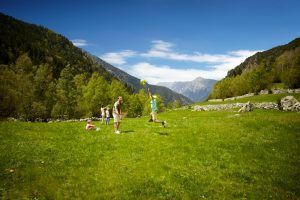 It is an educational & adventure amusement park, where adults and young learn (while playing) about the wild life and about the typical vegetation of the Pyrenees. The Naturlandia Animal Park is marketed specially for younger kids and families. Located at 2,000 meters above the sea level, it allows the observation of brown bears, wolves, fallow deer, red deer and groundhods. In Naturlandia, the visitor can also enjoy other activities such as the electric quads for kids or archeri. Adults have also interesting activities such as zip wires, the airtrekk or the impressive ride called ‘Tobotronc’. It is the longest alpine slide in the world that runs through the forest. 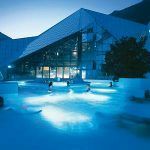 This offer is completed with the Caldea e Inúu Thermal Water Complex (located in the business center of Escaldes-Engordany), a place thought for relaxation and to enjoy the water. The thermal waters that appear to 70ºC, are special by their properties and contribute to the body benefits, helping to the rest and to recover the vitality and the well-being. The complex has large indoor and outdoor lagoon, as well as several other elements such as jacuzzis, waterfalls, water massages areas, etc. An area of Hindu-Roman baths with temperature difference water areas and a wellness area should be added to it. The APRM is an association non profit constituted by the shrines of Pilar, Torreciudad, Meritxell, Montserrat and Lourdes whose general purpose is the promotion of this Marian Route, its sanctuaries and the historical, artistic and natural ensembles of the regions where they are located.